Music therapy can help seniors at risk for dementia and Alzheimer's disease. Regardless of preferences on genre and style, music is something that all people can appreciate, no matter their age. Songs and lyrics can be associated with a variety of memories and feelings, and music has been shown to calm nerves, ease stress and help people relax. Individuals providing elderly home care services for patients at risk for dementia and Alzheimer's disease can use music therapy to keep older adults' cognitive function higher and possibly help slow the progression of the illness. 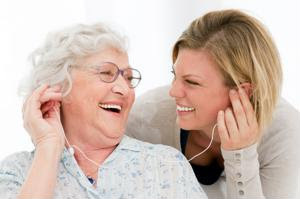 Additionally, music offers an opportunity for social interaction through singing, active listening or playing, which can distract from pain or negative feelings a sick senior may be experiencing.